Let them loose with the shimmer and shine while caring for the environment with our Bio Glitter in Silver. The perfect alternative to plastic-based products, this eco-friendly glitter has been specially formulated to help tackle the issue of microplastic pollution in our environment. It is naturally biodegradable - perfect for those glitter explosions that every teacher knows about - and comes in a recyclable plastic dispenser. Allow their imaginations to run wild with this versatile crafting product that is compatible with most adhesives and papers. 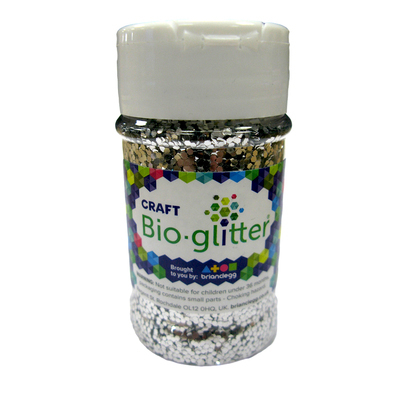 Create sparkling Christmas decorations or complete a night sky with the help of this bio glitter which needs 4x less product when used with specific glues. This shimmering product also comes in a gold colour - perfect for your royalty inspired masterpieces.